Photo provided by the Event Horizon Telescope shows the first image of a black hole. Astronomers have revealed the first image of a black hole at coordinated press conferences around the world. The Event Horizon Telescope (EHT) — an array of eight ground-based radio telescopes — was designed to capture images of a black hole, and its researchers have now revealed their success, unveiling the first direct visual evidence of a supermassive black hole and its shadow. The image reveals the black hole at the center of Messier 87, a massive galaxy in the nearby Virgo galaxy cluster. It is 55 million light-years from Earth and has a mass 6.5 billion times that of the sun. The EHT was the result of years of international collaboration and offers scientists a new way to study the most extreme objects in the universe predicted by Einstein’s theory of general relativity. "We have taken the first picture of a black hole," said EHT project director Sheperd Doeleman. "This is an extraordinary scientific feat accomplished by a team of more than 200 researchers." Black holes are extraordinary cosmic objects of enormous mass but extremely compact in size. Their presence affects their environment in extreme ways, warping spacetime and superheating any surrounding material. "If immersed in a bright region, like a disc of glowing gas, we expect a black hole to create a dark region similar to a shadow — something predicted by Einstein’s general relativity that we’ve never seen before," said EHT Science Council chair Heino Falcke. "This shadow, caused by the gravitational bending and capture of light by the event horizon, reveals a lot about the nature of these fascinating objects and allowed us to measure the enormous mass of M87’s black hole." Multiple calibration and imaging methods have revealed a ring-like structure with a dark central region — the black hole’s shadow. "Once we were sure we had imaged the shadow, we could compare our observations with extensive computer models that include the physics of warped space, superheated matter and strong magnetic fields. Many of the features of the observed image match our theoretical understanding surprisingly well," said Paul Ho, an EHT board member. "This makes us confident about the interpretation of our observations, including our estimation of the black hole’s mass." Creating the EHT was a formidable challenge which required upgrading and connecting a worldwide network of eight pre-existing telescopes deployed at a variety of challenging high-altitude sites. These locations included volcanoes in Hawaii and Mexico, mountains in Arizona and the Spanish Sierra Nevada, the Chilean Atacama Desert and the Antarctica. The construction of the EHT and the observations announced today represent the culmination of decades of work. This global teamwork required close collaboration by researchers around the world. Thirteen partner institutions worked together to create the EHT. Key funding was provided by the US National Science Foundation, the EU's European Research Council, and funding agencies in East Asia. 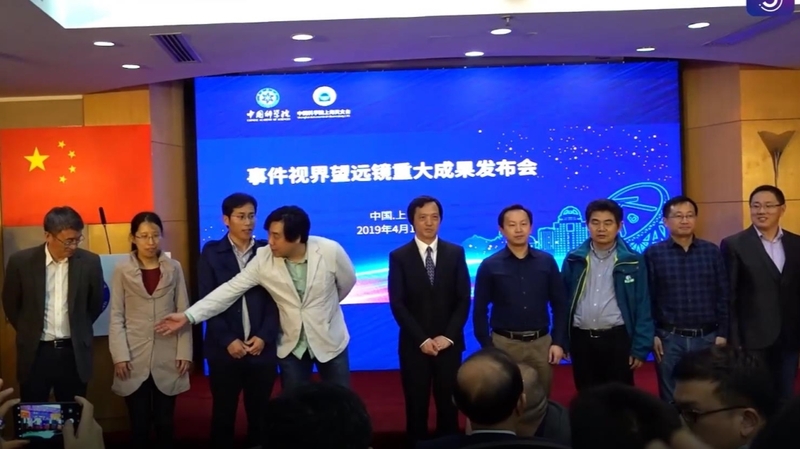 The project was also supported by the Center for Astronomical Mega-Science of the Chinese Academy of Sciences, co-established by National Astronomical Observatories, Purple Mountain Observatory and Shanghai Astronomical Observatory. The Shanghai observatory took the lead in organizing and coordinating researchers to participate in the EHT collaboration. 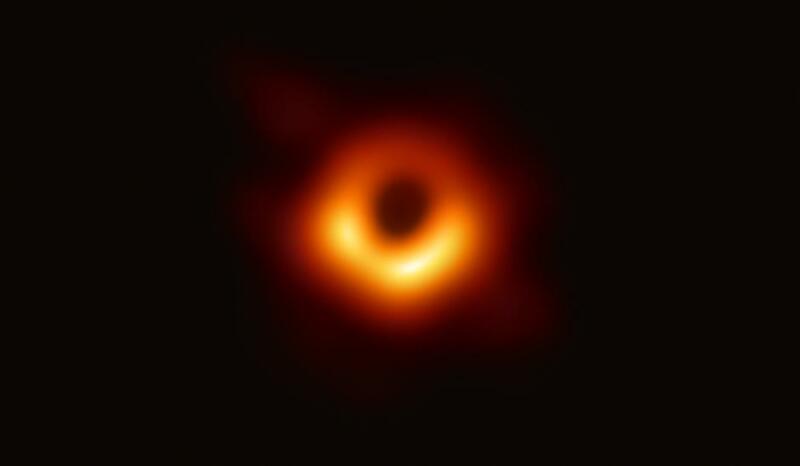 "The successful imaging of the black hole in the center of M87 is just the beginning of the EHT collaboration," said its director Shen Zhiqiang. "More exciting results are expected from the EHT project in the near future." He said it had taken nearly 240 years to approach black holes and obtain a close-up. Yuan Feng, deputy head of the local observatory, said the picture can be used to understand how black holes and relativistic jet form. 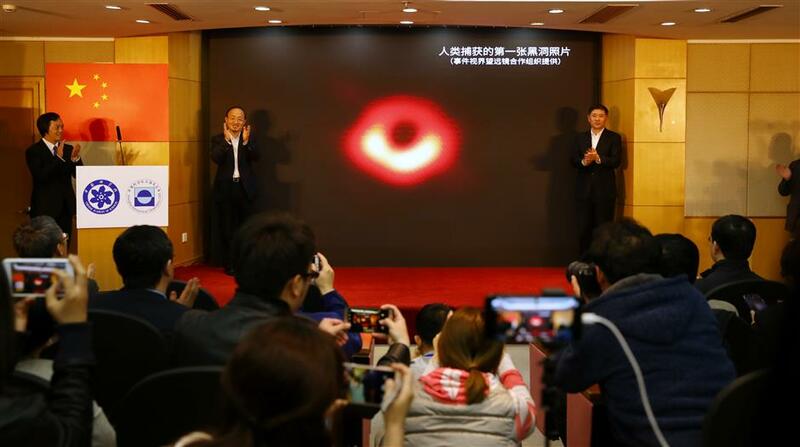 The first-ever picture of a black hole is released at a press conference in Shanghai. In 1783, John Michell, an English philosopher and clergyman, came with the concept of “dark stars” from which light could not escape and were, therefore, invisible. In 1796, French mathematician Pierre-Simon Laplace suggested essentially the same idea. They were also predicted in Einstein’s theory of general relativity in 1915. But it was not until 1968 that the term “black hole” was coined by American physicist John Wheeler. It was widely believed that a large galaxy would have a black hole, with the mass of millions of stars, typically situated in the middle. Black holes are totally black, and what you see depends upon what is shining behind and around it. However, taking a picture is not an easy task. Thanks to technological advances, a groundbreaking observation was made in 2015 when astronomers used gravitational wave detectors to track two black holes smashing together. It was the first time we could be assured that black holes really existed. The picture revealed today provides concrete evidence. Shen said 16 Chinese astronomers, including eight from Shanghai, had taken part in the project. Some of them went to work at the James Clerk Maxwell Telescope in Hawaii JCMT, on top of the 4,092-meter Mauna Kea. Ten of them showed up at the press conference. JCMT was included in the EHT project, he said. The project’s researchers obtained the first data in April 2017 from the global network of telescopes. The telescopes were trained on two supermassive black holes in very different corners of the universe to collect data. Sagittarius A*, in a mass of 4 million suns, is at the center of the Milky Way, and another, unnamed, is at the center of the neighboring Virgo A galaxy, 1,500 times the weight of Sagittarius A*. “The imaging algorithms we developed fill the gaps of data we are missing in order to reconstruct a picture of a black hole,” the team said on its website. Black holes live up to their name. Basically, it is a place in space that swallows almost everything. Hawking predicted black holes would emit thermal radiation and gradually evaporate. “However, most black holes will exist forever,” Zu said.